The AMPEX Series 351 Magnetic Tape Recorder/Reproducers are high quality precision instruments designed for the professional user who requires the finest and most faithful recording and reproduction. A basic recorder/reproducer in the 351 series consists of a tape transport for operation at tape speed pairs of 3-3/4 inches per second (ips) and 7-1/2 ips or 7-1/2 and 15 ips, a head assembly for use with l/4-lnch magnetic tape, and an electronic assembly which contains the record amplifier, reproduce amplifier, bias and erase oscillator, and power supply — all featuring etched board construction. Head assemblies for either full (single) track, half track or two track stereophonic (351-2) operation are available. CCIR equalization can be obtained on request when ordering equipment. Several mounting arrangements are offered - console, two case portable and rack mount. In the portable equipment, one case contains the tape transport and the other houses the electronic assembly unit. The 351 Series recorder/reproducers are available for full (single) track, half track or two track stereophonic operation. All operating controls are located on the tape transport with the exception of the record control which is on the front panel of the electronic assembly. When the remote control unit is fiimished, duplicate tape motion controls, a RECORD button and RECORD INDICATOR light and a TAPE MOTION indicator light are mounted on the remote unit. The equipment can handle the NAB 10-1/2 inch diameter tape reels or the EIA 5 and 7-inch reels. Provision is made for selection of proper tape tensioning at the REEL SIZE switch on the tape transport for the LARGE or SMALL size reels. Either of two capstan drive motor speeds can be selected at the LOW-HIGH TAPE SPEED switch which is also on the tape transport. On the front panel of the electronic assembly are facilities for setting RECORD LEVEL and (reproduce) PLAYBACK LEVEL, selecting LOW SPEED or HIGH SPEED EQUAUZATION, selecting three input arrangements by means of the INPUT TRANSFER SWITCH, and switch ing the vu meter at the METER and OUTPUT switch so that (reproduce) PLAYBACK, RECORD, BIAS and ERASE LEVEL(S) can be read. A phone jack (PHONES) for monitoring, a RECORD button, a RECORD INDICATOR light, and a POWER OFF-ON switch are also mounted on the electronic assembly front panel. Another MONITOR AMPLIFIER phone jack and a line termination (LINE TERM) OFF-ON switch are located on the back of the amplifier-chassis. Foundational text courtesy of the AMPEX Model 351 operation and service literature. 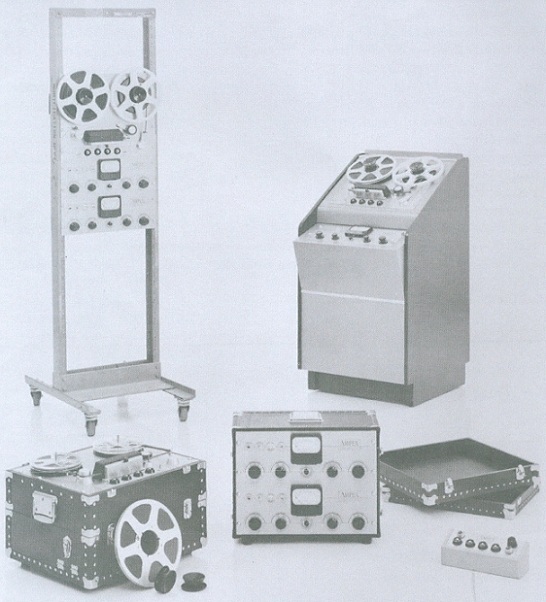 Do you have content, to add, about the Ampex Model 351 Tape Machine or associated topics? Please feel free to Share it, here!